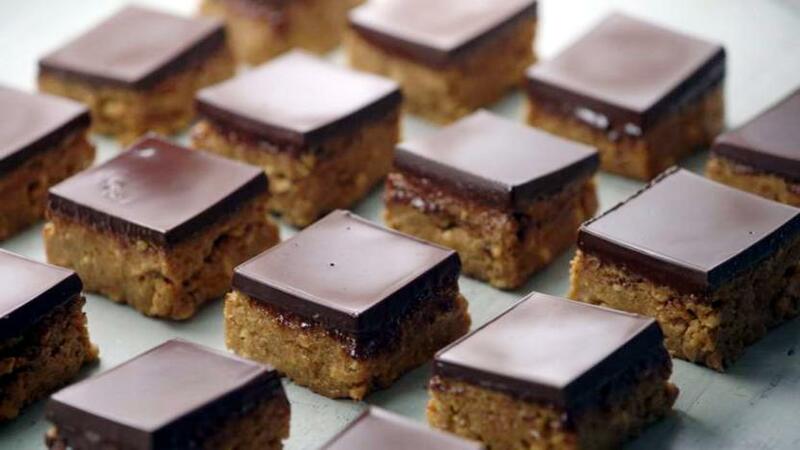 I was recipe testing some millionaire’s shortbread and found I did not have enough of the correct ingredients. A family-sized pot of crunchy peanut butter sat almost full at the back of my cupboard, providing me with some nutty inspiration for these peanut butter squares. Snap the chocolate into squares and throw into a small bowl. Melt in the microwave in 30 second blasts, stirring well between each addition or sit the bowl over a pan over simmering water. Make sure that the bottom of the pan does not touch the water or the chocolate may ‘seize’ and go really grainy and stiff. Blitz the digestive biscuits and brown sugar in a blender or food processor to give fine crumbs. Tip them into the melted butter. Stir in the peanut butter and vanilla extract and mix together so everything is well combined. Tip the mixture into the lined tin and press it down really hard with the back of the spoon. It needs to be really compact and tight. Then pour over the melted chocolate, tilting the tin back and forth a bit so that the whole thing is evenly covered. Pop in the freezer for 30 minutes to firm up (or the fridge for an hour). Once the chocolate is set, remove it from the freezer (or fridge). Lift it out of the tin with the help of the baking parchment. Remove the paper and then use a sharp knife to divide it into 16 squares and serve. These will last for a few days in an airtight container.